Flowserve’s IPS Beacon 2 Condition Monitor is Flowserve’s newest all-round monitor. By augmenting reliability-centred maintenance programs, the IPS Beacon 2 provides a cost-effective means of increasing uptime and extending mean time between failure (MTBF). It is estimated that less than 10 percent of all pump failures are attributable to normal bearing wear and fatigue. This means over 90% of bearing failures are avoidable—if prompt actions are taken from the condition monitor alerts. The beauty of this beacon is that it can be fitted to any rotating machine ie. Pumps, Motors, Fans, Bearing Blocks etc. Straightforward visual alerts enable efficient use of maintenance and reliability resources. The IPS Beacon 2 enables operators and maintenance personnel to quickly see which assets are in need of attention using LED visual alerts or by incorporating the optional Bluetooth Module and IPS Mobile Insight app available on Android and IOS operating systems. This approach improves reliability by helping customers allocate maintenance resources to focus on equipment that needs attention, instead of spending time checking data or performing maintenance on healthy equipment. Blinking green LED indicates normal operation. Blinking red LED indicates a current alert condition for temperature and/or vibration. Blinking red and green alternating LEDs indicate a past alarm has occurred, but the current condition is normal. Blinking yellow LED indicates that the runtime has exceeded the limit and maintenance of the rotating equipment is required. Update alarm levels, polling rates etc. 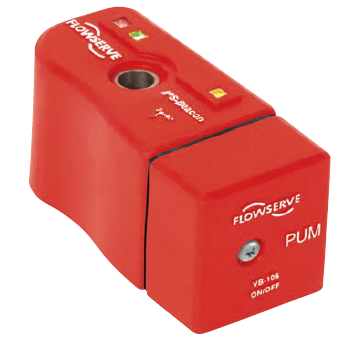 Check out Flowserve’s range of Condition Monitoring Products. This entry was posted in Flexachem and tagged Flowserve beacon, IPS Beacon 2, IPS Beacon 2 – Condition Monitor for Pumps. Bookmark the permalink.